Home › Ready? Set. Go! The Girl Scout Law is made up of guidelines to live by that help us relate to other people and the world around us in positive ways. The Girl Scout Law can be called an “ethical code,” because many parts of the law include moral values, or ideas of right and wrong. When you say the last phrase in the Girl Scout Promise, “. . . to live by the Girl Scout Law,” you promise to try to live by these guidelines. 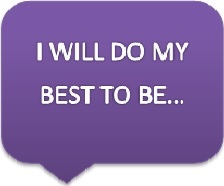 What does it mean to do your best? How is doing your best different from “being perfect”? What does it mean to do your best instead of someone else’s best? Describe a time when you did your best. How did you feel? Look up the word “creed” in a dictionary. Unitarian Universalists have no creed that we must accept. Instead, UUs hold many different beliefs about God, life, death, and other important topics. Most UUs feel it is fine to change our beliefs when our experiences and thoughts lead us to a new, different view. Read a pamphlet, an article, or a book on UU beliefs. Ask your advisor or another adult any questions you have about what you read. The text of all UUA pamphlets can be found online. HINT: You might find several pamphlets near the front door of a UU congregation’s meeting place; you can also read pamphlets on the website of the UUA’s Bookstore by typing “pamphlet” and selecting ‘keyword” (not “title”) in the online search box. Which of the UU beliefs described in your reading do you agree with? Are any confusing or unclear? Which beliefs are most and least meaningful to you? What else do you believe? Is the Girl Scout Law like a creed? Why or why not? Make a list of some of your own beliefs or use music, art, poetry or another creative way to express some of your beliefs. Your beliefs might include some of the UU beliefs you read about. They might also include other beliefs that do not appear in your reading.